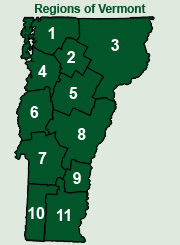 Visiting or Living in Vermont? Find Great Day Trips! The best thing about visiting, vacationing, or living in Vermont? Travel to and from some of the neatest parts of the Northeast is a breeze! For residents and visitors, day trips to great places in around the region are one reason visitors often become residents! The nearby regions of Saratoga Springs, Lake George and Boston add a whole new dimension to planning unforgettable Vermont vacations! Albany NY: Located just minutes from Southwestern Vermont, Albany is the Capital of New York State, rich in history, architecture, culture, sports and events for all seasons! Whether you're planning a vacation or living in Vermont, put Albany on your day-trip list and explore the Albany.com City Guide for restaurants, shopping, and attractions before you go. Adirondack Park Region of Upstate NY: A not-to-be-missed excursion, the Adirondack Mountains are just a Burlington ferry-ride away from our own lush Green Mountain State locale! Glacial lakes, natural waterfalls, and mountain charm are everywhere. Find the best places to dine, explore, and play at Adirondack.net. Lake George NY: Accessible from all of Vermont, Lake George NY sits on the shore of beautiful Lake George in the Adirondacks, an impressive 32-mile lake south of our own Lake Champlain shores. With over 300 islands, miles of stunning "forever wild" shoreline, attractions, cruises and activities, you'll want to add Lake George to your day trip list for your Vermont vacations! Visit LakeGeorge.com to plan your trip! Saratoga Springs NY: Just a short distance from the Western Vermont regions of Killington, Rutland, Manchester and Saratoga is a Mecca of thoroughbred horse racing, renowned mineral spas, and American history! When you're in Vermont, travel to Saratoga to relive the Battle of Saratoga,	discover the luxury of healing mineral springs, or spend the day enjoying the excitement of horse racing at the harness or flat tracks. Stroll through the Yaddo rose gardens, see the ballet, jazz or orchestra ... shop the many boutiques and shops, and see the stately Victorian homes from the days of the Great and Gracious. Visit Saratoga.com for more information about the area. Boston MA: Whether you're vacationing here or living in Vermont, travel to Boston MA is well worth the trip! Boston offers attractions, cultural activities, world class dining and a glimpse into our American history. An ideal Vermont day trip, browse SearchBoston.com for information on tours, attractions and more. Fort Salem Theater: A short DayTrip across the VT/NY border from Sandgate, VT will lead you to one of the premier summer stock theatres of the Northeast, known for the professional quality of its family-oriented musicals, comedies and occasional dramas. Visit the Fort Salem Theater for contact info and information about upcoming productions.